Our thoughts are creative and our ability to build a winning mindset is determined by the internal dialogue we have with ourselves. Lewis Hamilton approached Ron Dennis (MD of the McLaren Formula One Racing Team) at an awards ceremony when he was ten years old and confidently stated that he intended to drive for McLaren and win the World Championship. Lewis was clearly demonstrating his positive mindset that had been nurtured within his family environment and the rest as they say is history. Successful people, as we have seen have established a laser-like focus on the winning performance that they desire, and the second critical element they all possess is a total belief in their ability to manifest their desires. Even in the face of the greatest adversities they never lose their winning mindset and 'I CAN’ mentality. You will have people within your business that display similar capabilities but how can you encourage the rest of your people to strengthen their mindset and maximise their belief in real success? Ultimately you can never control how other people think, but you can increase your awareness of the patterns of thought that they experience by monitoring their emotions and behaviours. If someone is displaying negative emotion or performance blocking behaviours then the root cause is the internal dialogue they are having with themselves at that specific moment in time. There will be a temptation to analyse the cause of ‘what is not wanted’ but there is no need as you will be focusing attention in the wrong direction. 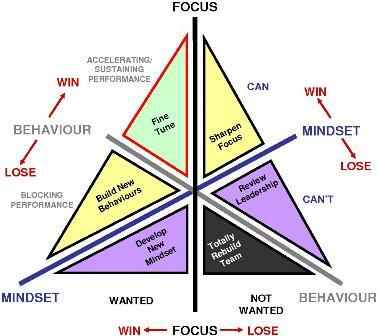 As long as appropriate time has been invested in creating a detailed picture of ‘what is wanted’ then the path to success will be to refocus them on the vision of winning performance and the vital contribution that they can deliver. It is inevitable that these will become apparent in one form or other as even Michael Schumacher can have a bad day, but the mark of a true winner is determined by their resilience and commitment to maintain a positive mindset regardless of the conditions around them. Therefore the role of every winning organisation is to create an environment that supports and nurtures a strong, positive mindset amongst its employees in the bad times as well as the good. Does the current environment in your organisation enhance the ‘I CAN’ winning mindset in your people?